I recently spent a great week at Monticello working with the educational staff on developing some online curriculum. During my stay I took a ton of pictures. Today I worked with some of my favorite pictures and added some quotes by Jefferson to make a variety of 8" x 10" wallpapers. Enjoy and please share if you like. I like gadgets. I'm typing this on my iPad, have my cell phone in my pocket and am never far from my digital camera. I imagine that if Jefferson lived in modern times he would probably be a gadget guy as well with so much information at his fingertips. The new thing that I learned this past week about Jefferson which I found most fascinating was the portable notebooks he used to write down short notes. Jefferson keep detailed notebooks on items such as his buildings, the weather, his plants, etc. but he did not carry around all of these books with him during the day. Instead, he carried a small notebook made of small pieces of ivory. These portable notebooks were tiny but folded out like a deck of cards. Jefferson wrote notes on the ivory with a pencil and then transferred the notes to his more permanent record books at home. He would wipe the pencil marks off the ivory and start with a clear notebook the next day. The visitors center at Monticello has two of these ivory notebooks from Jefferson on display and I have included a picture with this post. I find these very interesting and inquired about any replica notebooks that could be purchased. No one knew of any replicas but Jacqueline Langholtz, a member of the Monticello education staff, told me they once created replicas for the learning center and suggested that use old piano keys to make a replica. I think I will try to make a replica of the notebooks this summer to use in my class. If anyone has about 5 or 6 old piano keys let me know and will incorporate them in my project. Note : You can see all of the pictures I took during my visit to Monticello here at the set I have posted on Flickr. 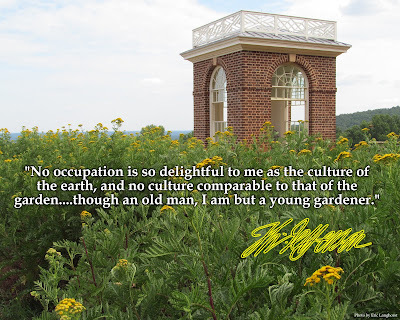 During my week at Monticello one of the things I enjoyed most was seeing Jefferson's garden and learning a little more about his approach to gardening. The mere sight of Jefferson's 1000 foot long garden at Monticello is impressive. The garden has been painstakingly reconstructed on the same site and is currently growing the same vegetables. I enjoyed walking through and seeing many of the same items we know grow in our own small family garden. Jefferson is sometimes given erroneous credit for single handedly introducing certain vegetables to the United States, like the tomato. He did, however, help to advocate for increased popularity of some vegetables which were not common in the United States at the time. His garden at time would have definitely been a "revolutionary garden". As you walk the garden it is impossible to not be touched by the beauty of the surroundings. The garden is built on the side of the mountain upon which Jefferson built Monticello with an amazing view looking out over the valley and the towering big mountain of Montalto keeping watch. In addition to the garden, Jefferson also surrounded himself with beautiful flower beds and trees. The flower beds surrounding the house have a wide variety of species. He also had systems created to collect rainwater runoff to help water his plants. If you visit Monticello I would recommend the garden tour. It was a very informative 45 minute tour and I learned a lot about Jefferson's involvement with plants on the grounds. I wanted to read up on the garden when I returned home so I purchased the book "A Rich Spot of Earth" by Peter Hatch. Hatch has been the gardener at Monticello since 1977. I highly recommend this book if you want to learn more about this topic. It is both a coffee table book with incredible photography and informative read with historical perspective and background on the types of vegetables grown. This book is a must if you have an interest in Jefferson's garden. As I walked around Monticello last week I found myself thinking about how Jefferson would like use to remember him today if we could only focus on one of his talents. Would he like us to think of him as the one who crafted our most important document? Would he want us to think of him as an architect first as we wait for hours to take a tour of his 200+ year old house? Is he most proud of his contributions as a gardener? What of his ability to adapt and implement the inventions around him in an attempt to create a more comfortable and efficient life? I personally think his answer might vary from day to day but last week as I walked around his grounds I thought first of his ability to create a tranquil and beautiful place on this "rich spot of earth". Background : I applied last year for a Barringer Research Fellowship to study Thomas Jefferson at Monticello for two weeks this summer. my research proposal included researching Jefferson and creating a Twitter feed in which followers could learn a little bit about him each day of the year through links, quotes, pictures,videos, etc. I was contacted by the educational staff at Monticello and they asked me if instead I would participate in a week long teacher forum they were conducting to help in the development of new online teacher resources for Monticello. It sounded like a unique opportunity to mix history and technology so I jumped at the chance. I worked with the Monticello educational staff and teachers from different parts of the county with a variety of connections to Monticello on July 8-12, 2012. “The boisterous sea of liberty is never without a wave”. One of my personal struggles as a teacher is finding the time to prioritize the manner in which I teach U.S. history. There are so many people, events and topics which I have enjoyed learning about and gathered resources to teach. I am challenged each year to negotiate the pace of my school year to accommodate them all. This week I have been fortunate enough to spend an entire week at Monticello working with the educational staff here as well as fellow teachers from different parts of the country. We have had access to numerous resources and experts. To borrow an often used phrase, it has been a lot like trying to get a drink from a firehouse. I always enjoy listening to someone who has devoted a large portion of their life to the study of one topic. You can almost see the passion ooze from their pores as they present and share. This week we have listened to scholars and researchers share their depth of understanding on Jefferson, an individual who I believe is probably one of the more intriguing and complex personalities of the founding era. At the conclusion of workshops such as this - periods of time where I am afforded the luxury of experiencing history on a deeper level - my biggest hurdle also provides an exhilarating opportunity. How do I synthesize all this information into a condensed version which we help my 8th grade students understand this individual and the broader context of the time in which he lived? It would not be difficult for me to devote an entire month to the study of Jefferson for there is truly that amount of compelling and engaging content available. But reality forces me to realistically utilize about five days specifically on Jefferson, roughly 250 minutes. As the week here at Monticello progressed, I tried to identify several major themes that I would like my students to learn about Jefferson. My Jefferson themes include: innovation, politics, role in western expansion, and complexity. I think one of the most powerful and currently relevant aspects of Jefferson's personality is his ability to innovate. I truly believe that the course of our nation's history in this century will be determined by our ability, or inability, to innovate. Jefferson is often thought of as an inventor but as the Monticello curator told us in one of our lectures this week, he only truly invented one item in his life - a specifically designed plow. What he was brilliant at was the ability to use and modify things to fit his needs. Let's be honest, very few of us will ever invent something like Twitter, but many of us will become successful in learning how to use something like Twitter to met our needs. I am currently half way through the Steve Jobs biography and I have found it very interesting that on multiple occasions during my time at Monticello someone has made a comparison between Jefferson and Jobs. I think sharing with students the ways in which Jefferson was an innovator is not only "cool", but also demonstrates to students the power of design and adapt the items around you to best fit your needs. We discuss the contributions of Jefferson politically when we study the American Revolution, but I typically also discuss the importance of Jefferson taking office as a member of a different political party and the accomplishments / tribulations of his presidency. If I had to select one big picture message that I hope my students grasp from our discussion of Jefferson politically, specifically in terms of his contributions writing the Declaration of Independence, it would be the understanding that he utilized the writings and philosophies of many other individuals. I think the importance of this is similar to the importance of understanding that he was more of an adapter than an inventor. Jefferson was obviously an incredibly gifted and talented individual - I always use JFK's quote about Jefferson dining alone in the White House - but if we only hold him up as this amazing, one in a billion type of super intellectual I think we are missing a huge opportunity to teach our students that often times great ideas are truly built upon the shoulders of giants. Teaching about Jefferson's research on the great political philosophers of history is an opportunity to again demonstrate to our students the importance of research, reading and scholarship. I also like to show students his rough draft of the Declaration of Independence. If Jefferson can survive a little editing, I think we all can from time to time. I think it is important for my students to appreciate the impact Jefferson had on our home state of Missouri as a result of his policy and personal beliefs pertaining to western expansion. As a Missouri resident I see the impact of Jefferson on a daily basis. The land on which I live and teach is of course part of the Louisiana Purchase and when I visit our state capital I drive to Jefferson City. The Corps of Discovery is also strongly intertwined in our local history since the expedition traveled through our county. Beyond the political aspects of western expansion, I also feel I owe Jefferson a debt of gratitude for the passion he shared in regards to western expansion. Jefferson helped create a buzz and a sense of urgency about exploring and claiming the west. As someone who has lived their entire life in the flyover states, that passion brings me a little closer to Jefferson. Virginia will always own Jefferson but I feel a connection to him as a Missourian as well. The contradictions in Jefferson's life make him a complicated individual to teach students but it also provides a powerful lesson. I have found that students in my classroom today like their history to be wrapped up in a nice, tidy package that they can grasp so that they can understand it and move on. We know that history doesn't work that way. History is messy and complicated. Jefferson's life is a great illustration of how no one is perfect in everyone's eyes and no one can be easily defined. I don't think that Jefferson is unique in this regard, complexities can be found in the lives of all of the Founding Fathers, but I think Jefferson's life is an interesting case in which to discuss some of these issues. 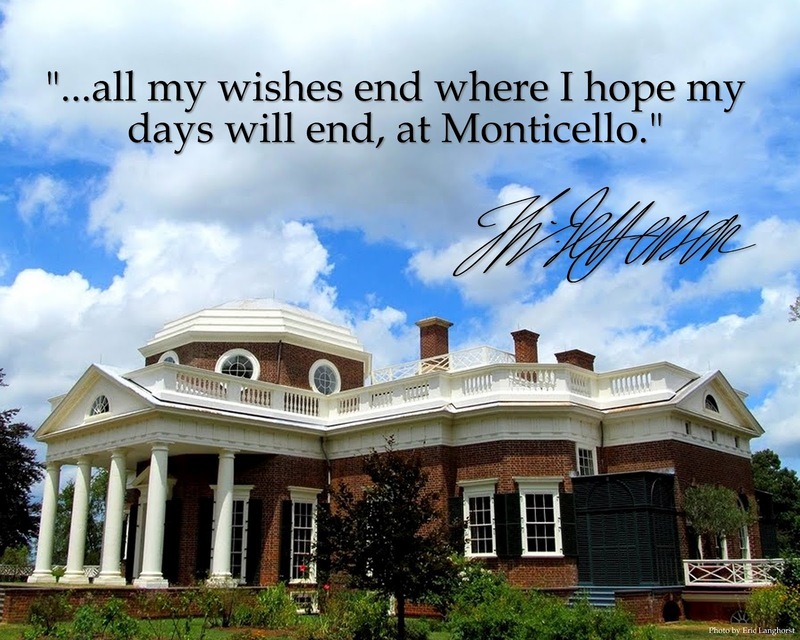 My challenge now as I leave Monticello with a thousand ideas bouncing around inside my head is to cultivate them down to several activities that will teach my students about Jefferson in the context of those four themes. This is a part of my profession that I love but it is also a challenge, especially in today's age of technology which provides so many directions that it is difficult sometimes to weed out what best meets your needs. 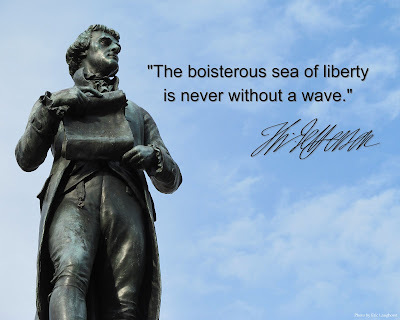 I will spend some time this summer to formulate some Jefferson lessons and when I do I will share them on this blog. I would like to thank the Monticello education staff for an absolutely amazing week of learning, discussing and sharing. I am afraid if I start naming names I will leave someone out. Their staff made all of us feel so welcome and I never felt as if I was invading their turf, rather I felt as if I was being welcomed to experience the work they enjoy and for which they have so much passion. The other participating teachers that I shared the week with are equally incredible. We shared ideas and talked about our profession in a way that is becoming increasing rare in education and I appreciated the opportunity. There is just something special about discussing the founding fathers while enjoying a good meal. The week helped my charge my batteries and get me excited about my next chance to teach Jefferson and for that I thank everyone who made it possible.